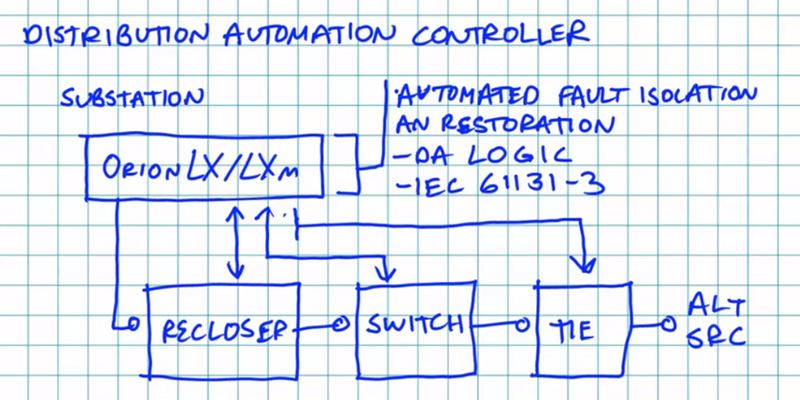 An OrionLX or LXm can be configured as a Distribution Automation (or DA) Controller in a Fault Location, Isolation, and Service Restoration (FLISR) scheme. Orion collects data from feeder mounted reclosers, switches and sensors, identifies the faulted section, isolates it and restores service to unfaulted sections from an alternate source. DA logic in the Orion is pre-configured and requires only point and click for simple schemes. Math and Logic, including IEC 61131-3, is available for more complex schemes. Pick Lists for commonly used recloser and switch controllers; Cooper, SEL, G&W, etc. Pre-engineered logic to enable the OrionLX to identify location of the fault, isolate faulted line section and restore service to unfaulted section. For serial communication to DNP3 IEDs. Compliant with Level 2. Includes “DNP3 Passthrough” to pass through DNP3 vendor software to connected IEDs. Supports Secure Authentication Version 5. For TCP/IP communication to DNP3 IEDs. Compliant with Level 2. Supports Secure Authentication Version 5.